The Tudor connection? Dissolution of the monasteries under Henry VIII. What you see are the ruins of a gothic church built in the mid-13th century by the Cistercian order under the patronage of Henry III. Three hundred years later the church had been converted into a great hall for the use of William Paulet, who was granted title to the abbey after the first wave of state confiscations in 1536. The entire complex became a country house for one man. One. Single. Man. 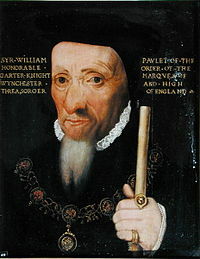 Paulet was an important politician – knight of the garter, earl, marquess, appointed as regent to Edward VI – and no doubt he had a large family and retinue, but the ambition was awesome. Although Paulet altered the fabric of the abbey buildings, much of his work was stripped away in the 18-19th centuries to reveal the original architecture. The historian Geoffrey Elton argued that the Tudor reformation was a “top down” revolution. Social historians argue for a “bottom up” revolution. The history of Netley Abbey shows that the revolution was, in the first place, “sideways”, with a transfer of wealth from one institution to another: church to state. Paulet was a primary beneficiary – in my view, a Tudor equivalent of the modern investment bank, which receives cheap money from the central source and distributes that money at great profit. There were many like him. The rampant foliage is gone, replaced by a bland carpet of grass, but the abbey is well worth a visit. Quite remote, not too far. Wikipedia has an excellent article.